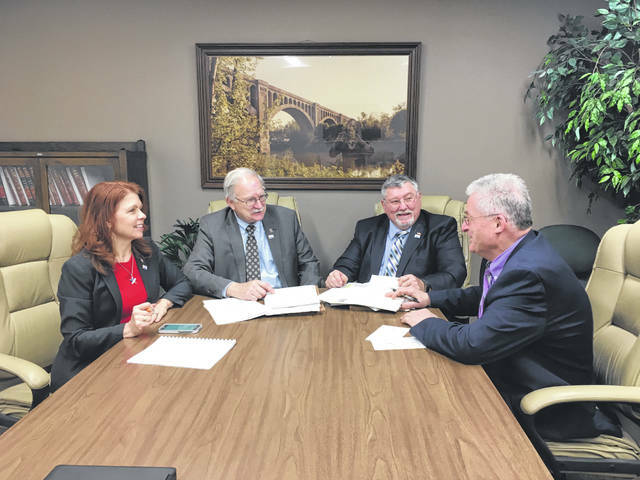 County Commissioners Julie Ehemann, Tony Bornhorst and Bob Guillozet meet with Shelby County Bicentennial Committee Chair Mike Barhorst to work out the final details of the opening ceremonies, scheduled for April 1 at 7 p.m. at Sidney Middle School. SIDNEY — The programs are at the printers! Preparations for decorating the venue have been made. Conference calls between the governor’s office and bicentennial officials have hopefully eliminated any snags that may remain, and the schedule for the Shelby County Bicentennial opening celebration has been set. The opening ceremonies, scheduled for Monday, April 1, at 7 p.m., will be held at Sidney Middle School. There still are a limited number of tickets remaining for the event. Shelby County Bicentennial Committee Chair Mike Barhorst is scheduled to make opening remarks, then introduce the Rev. Steve Shoup, dean of the Roman Catholic Archdiocese of Cincinnati Sidney Deanery, who will offer the invocation. Shelby County Commission President Julie Ehemann will welcome those in attendance. She will be followed to the podium by Miami County Commission President Gregory Simmons, who will offer remarks. Shelby County was created in 1819 from what was once a much larger Miami County. The Shelby County Bicentennial Choir will then sing “Beautiful Ohio” after which Ehemann will introduce Gov. Mike DeWine. DeWine, elected to Ohio’s highest office in November, is serving his first term as governor of the Buckeye State. Although reported to be behind in the polls prior to election day, DeWine defeated challenger Richard Cordray, 50.4 percent to 46.7 percent with largest turnout in Ohio history for a governor’s race. In fact, DeWine carried 79 of Ohio’s 88 counties, including Shelby County. No stranger to Shelby County, Ohio’s 70th governor has frequently visited the area. DeWine previously served as a state senator, a United States senator, and as Ohio’s Attorney General. Following the governor’s address, the Bicentennial Choir will sing “America the Beautiful.” Shelby County Commissioner Tony Bornhorst will introduce 12th Ohio Senate District Sen. Matthew Huffman, R-Lima, who will offer remarks. Following Huffman’s remarks, Shelby County Commissioner Bob Guillozet will introduce 84th Ohio House District Rep. Susan Manchester, R-Waynesfield, who will offer remarks. Following Manchester’s remarks, Barhorst will introduce Shelby County Ministerial Association President Rodney Reynolds, who will offer the benediction. The Shelby County Bicentennial Choir will sing “God Bless America.” Barhorst will offer closing remarks as the county’s flag will be removed from the stage and begin its near year-long trek from bicentennial venue to venue within the county. The Shelby County Sheriff’s Honor Guard will retire the colors. Because of limited seating, only those with tickets will be admitted on April 1. Two tickets per request can be obtained by email (mbarhorst@sidneyoh.com). The request must include a mailing address so that the tickets can be forwarded to the individual making the request. The evening of the event, representatives of the US Postal Service will be on hand to hand cancel postcards with the special bicentennial post mark. There will be post cards available for purchase from every village in Shelby County that has a current post office, as well as the village of Lockington. Post cards for the individual villages can be obtained from the post office in that village. The evening of the opening ceremony, the special cancellation will only be available for the Sidney Post Office. There will also be a limited number of specially minted .999 silver bicentennial coins for sale that evening. The coins are $40 each. “We’ve been planning for the bicentennial celebration for more than 18 months,” Barhorst said. “Co-Chair Bob Guillozet has been an immense help, as have Julie (Ehemann) and Tony (Bornhorst). Shelby County is fortunate to have their leadership. “There’s no question that residents of Shelby County as well as visitors will be able to experience a wide range of activities,” Guillozet said. “Whether you have a passion for antique quilts, Indian artifacts, or simply learning more about Shelby County – where we’ve been and where we are going – there is an event that will help to both inspire and educate you.